As a veterinarian with the American Animal Hospital Association (AAHA) and the mother of two young children, I’m busy 24-7. To keep the family machine running smoothly, I record everyone’s daily activities in my iPhone and hope for no slip ups; missing a karate class can be catastrophic to a 5- and 7-year-old. However, when it comes to health, I’m hypervigilant; sickness can derail a smooth-running train. That’s why I’m first in line every fall for a flu shot. And so are my dogs. The canine influenza vaccine (or simply called dog flu) is important if your dog comes in contact with other dogs. The virus is spread when respiratory secretions are exchanged among dogs who are barking, sneezing, or coughing. Outbreaks occur yearround but tend to spike during months when families travel with their pets and board them. There are two strains of dog flu in this country. H3N8 reared its head in 2004 on Greyhound racetracks in Florida. It spread like wildfire until a vaccine was developed. More recently, in spring 2015, the Asian-born H3N2 clobbered Chicago. Unfortunately, there was no vaccine to protect against the strain. When the outbreak hit, veterinary hospitals were packed to capacity with sick dogs. Some came in coughing, others had labored breathing. Dogs were tired and had mucus dripping from their eyes and nose. The sickest dogs experienced all these signs. Veterinarians faced the challenge of treating the sick dogs while not infecting the healthy ones. Another noted Chicago veterinarian, Dr. Natalie Marks, co-owner of AAHA-accredited Blum Animal Hospital, recalled the outbreak. “It was controlled chaos in our hospital. We evaluated all patients in exam rooms instead of in the treatment area where we keep our equipment in an effort to avoid contaminating dogs who were visiting for regular checkups. If patients had a normal appetite, body temperature, oxygen level, and energy level, we managed them as outpatients. However, if they had a fever, were vomiting, not eating, or were incredibly lethargic, we began in-hospital therapy until their stability level met our criteria for outpatient care.” The critically ill received oxygen therapy, IV fluids, and antibiotics to protect against bacterial invaders taking advantage of weakened lungs. Can I catch H3N2 from Winnie? As far as we know, H3N2 does not infect people. Can Winnie infect my cat? She’s keeping us up all night with her coughing. How can I make it stop? There’s no easy solution to quell the coughing, but ask your vet about cough suppressants. Bringing up mucous and phlegm is actually a GOOD thing. You can encourage this by using a humidifier to moisten her airways. My personal favorite? Keep her in the bathroom with the door closed while you shower. The warm, wet air will help her to cough up the mucous. She’s supposed to go back to doggie daycare next week. Is that OK? Where will it hit next? Though we haven’t had any reported cases of H3N2 at the hospital where I practice in New Jersey, my pet parents continue to ask questions: “Will it hit our area?” “Can a dog die from it?” Reports show that 80 percent of dogs exposed to H3N2 get sick from it. The remaining 20 percent don’t get sick but harbor the virus and can spread it. The percentage of dogs who die from the disease is less than 10 percent. In November 2015, the H3N2 vaccine was developed, and the virus has traveled to more than 30 states. It could continue to spread if pet owners don’t vaccinate their dogs. If your dog exhibits signs of dog flu, visit your veterinary practice immediately. If the vet suspects H3N2, he may swab your dog’s nasal passage or extract a vial of blood for diagnosis. Many signs associated with dog flu, like coughing, lethargy, and eye and nose discharge, are also indicators of other illnesses. Coughing is almost always serious; your dog could be suffering from a number of diseases including heart failure, heartworms, and “kennel” cough. Thousands of dogs have contracted H3N2. Could yours be next? If your dog is lethargic, coughing, sneezing, or has a runny nose and eyes, he could have dog flu. The best way to help prevent dog flu is to vaccinate against it. 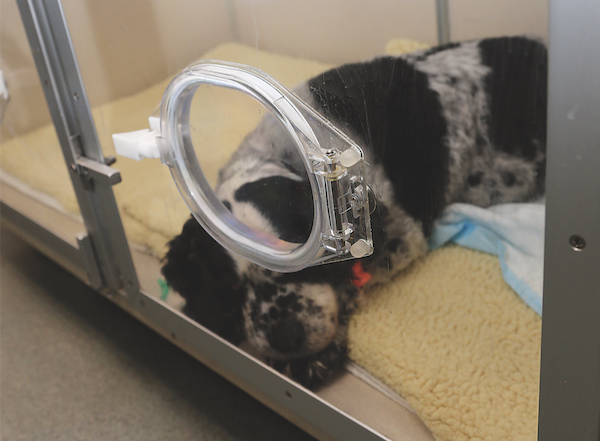 Less than 10 percent of dogs suffering from H3N2 will die. The post What You Need to Know About Dog Flu — Prevention and Treatment appeared first on Dogster.